What the heck is up my friends! What a ripper day to be alive for no other reason except to be alive! I pray this rant finds you smiling like a fox! Well things are going well in Grills land. I have just completed my first week of my 50km program (Hares and Hounds) and this included 11.5km completely barefoot and 66.5km in sandals. Apart from a little soreness in my right forefoot (which has now come good) it was a top week. I have been hearing some funny stories from friends of friends etc about the 'bloke running in sandals', and hearing comments like 'do you really run with NO shoes on?!'. This will then usually follow with a short conversation about same and some puzzled looks! Makes me smile! One particular conversation made me laugh the other day with a friend stating that barefoot running is such a 'new concept' that it hasn't had time to be tested! Umm...I'm pretty sure SHOES are the 'new' concept...maybe I am missing something?! I am also finding myself to go unshod more and more...this may cause problems with the wife? Time will tell! Ha! All in all, so far it has been an enjoyable experience. I have also been running with my hound, who LOVEs the run! So, onto the title of this blog. 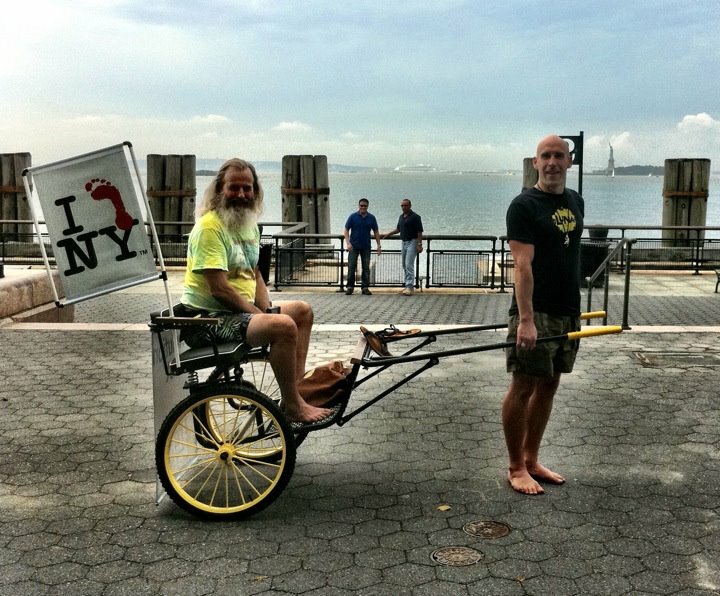 I have been inspired by Barefoot Ted and his Rickshaw! 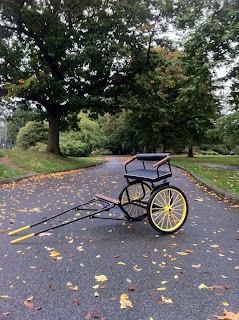 I am on a hunt...call it a quest to find/build my own Rickshaw! I have done some research on the net and mainly only located pedal rickshaws. I however am looking for a pull along one, like the ones pictured (note the cool sign on the back!). I seek your assistance! I need some help in trying to either get an old one that I can renovate, or get in touch with someone who might be able to build one! The dream I have it to acquire one and set up down at Bargara (the beach at Bundy) and take people for a trip along the coast line, possibly to Burnett Heads Lighthouse (about 10k) with me running barefoot or in my sandals! I would then set up a little picnic for them, leave them alone for a hour and then run them back the 10k to Bargara. I reckon it would be stella! I would enjoy it anyway, even if they didnt! I would love some feedback on your thoughts and as I said, any advise about acquiring a rickshaw would be GOLD! Apart from that, all else is bonza! I am very excited for the next couple of days. Tomorrow, Tegan and I go away and celebrate our 9year wedding anniversary! It is hard to believe that that time has gone so quickly! Every day spent with my bride has enriched my life and I am so thankful that she puts up with my madness! It will be a super time away together! We are then spending two nights in Brissy and yep, it is tattoo time again! Cant wait! Getting my left arm finished, very excited! As usual I will be going to Westside Tattoo in West End, Brisbane, so if you want any drawings on your skin, head there and tell em I sent you! Well comrades, I hope that your week is filled with joy and happiness! Run hard, smash some hills, do a somersault, be nice to someone who is hating on you, kiss your dog!! Keep smiling, fit and loving life. Life is good people, no matter how bad things are, you are still blessed! I love you all, peace, hippy and happiness!